Both of these teams lost in their opening game last week, so this is going to be a game featuring two sides that are desperate to get a win. The team that does triumph can take great comfort and delight in getting off the mark but the losing side knows they’ll have a 0-2 record and they’ll start to be left behind at the foot of the table. The hosts really need a good showing in this game as they were absolutely mauled last week. The 95-58 defeat against Valencia was the biggest loss in the team’s Eurocup history, which spans four seasons. The margin of defeat was bad but the overall performance was of a poor nature as well. There is a need for experienced players like Tim Olbrecht and Per Guenther to stand up and make sure the team pulls together in this one. A positive result in this game can wipe away last week’s result but a further loss can create a bad atmosphere around the club. It is not as though Olimpija are coming into this game in much better form. They lost out at home last week, falling 64-72 to Lokomotiv Kuban Krasnodar. Again, the side from Ljubljana were off the pace and far from their best but they’ll be looking to rebound in this game. If players like Stevan Milosevic and Nikola Jankovic find form and stand up for themselves and their team-mates, this could be a big night for the away team. The winner of this game may be the team with the stronger mental edge, so there is a need for both teams to show resolve and determination. Given the thrashing they took last week, the hosts will be desperate to get back to winning ways, and they should. 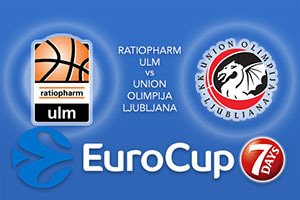 However, you can take Union Olimpija Ljubljana at +11.5, which is provided at odds of 1.90. There is also the Over/Under market available for this game and if you are interested, you should consider going OVER 164.5 which is provided at odds of 1.90. Bet Now!